On 2 October 2018, we made our way to the Union Jack Club in London to introduce our fabulous new collaborators arthur+martha to the regional organisers and trustees of the War Widows’ Association (WWA). Thanks to our recent funding successes with the Arts and Humanities Research Council and Arts Council England, we have been able to partner up with the talented Lois Blackburn and Philip Davenport (arthur+martha) in order to give war widows the opportunity to tell their stories in more creative, succinct, and visual ways than we have done so far in our oral history interviews. Lois and Phil are the creators of a host of participatory arts projects in which they co-created moving and beautiful art to help people tell difficult stories and process traumatic experiences, including Stitching the Wars and The Homeless Library, among many others. War Widows’ Stories, like arthur+martha’s work, is a participatory project: we want war widows to have a say in and be active contributors and co-creators of our research and how we conduct it. For example, we have trained volunteer interviewers from the war widows community whose experiences and judgments shaped the themes our interviews cover. In a similar spirit, Lois and Phil wanted to meet members of the WWA in order to discuss and get feedback on their ideas for the project thus far. What common images and themes might hold the poetry together? What kinds of topics and questions might help women open up and find the language they want to use in their art? 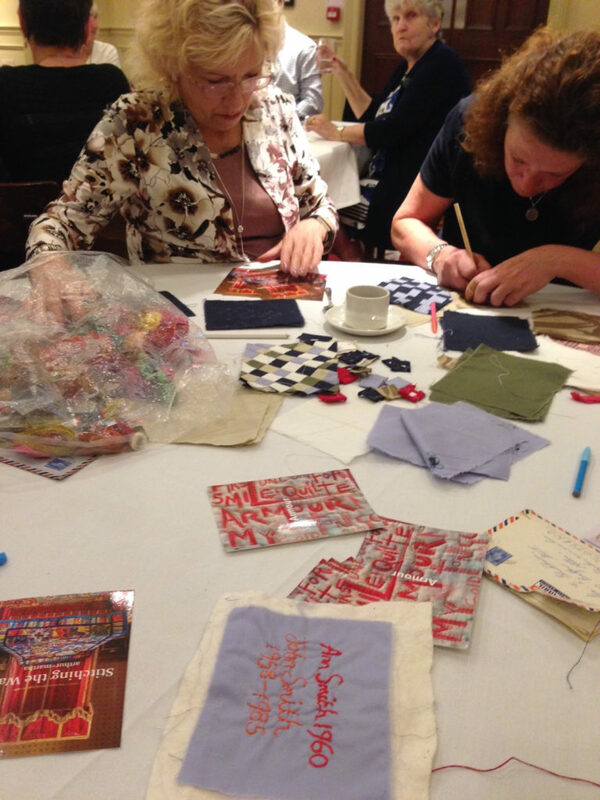 What materials and colours would be most appropriate and meaningful for our war widows’ quilt? 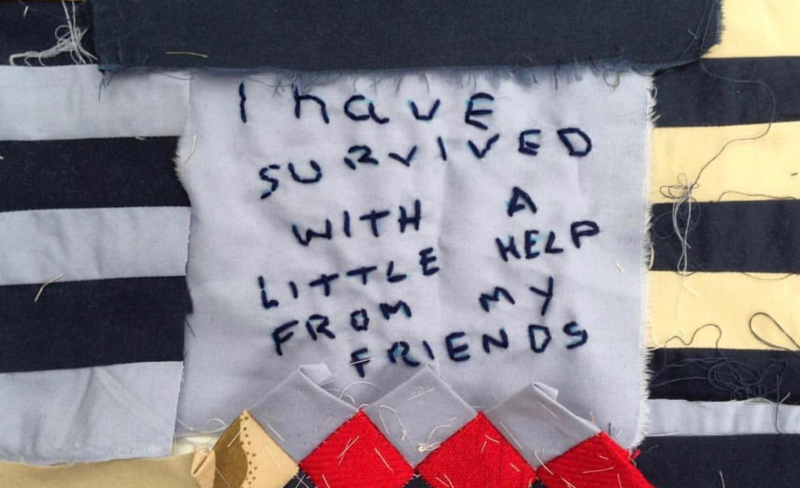 One of the first squares of the war widows’ quilt. The WWA regional organisers’ dinner in London provided a first and ample opportunity for just that, and more. Talking to women throughout the evening, Lois and Phil gained their first insights into some of the stories war widows have to tell. Little did we anticipate that an evening of food, laughter, and moving conversations would culminate in an impromptu sewing session when Lois encouraged the women to handwrite their own (and, if they wanted, their partners’ names) – or any meaningful phrases or words – on a piece of material and stitch it. Our war widows’ quilt began then and there! 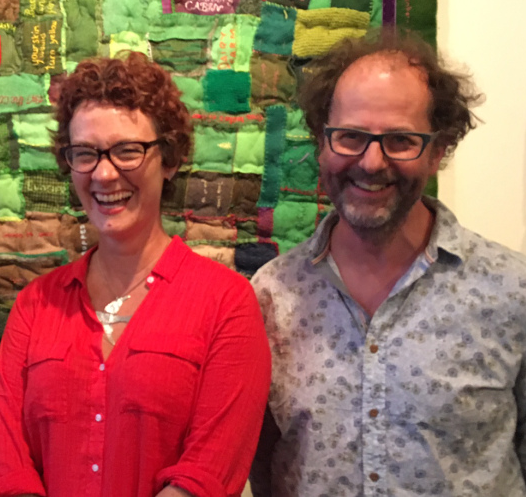 WWA regional organisers experiment with fabrics and thread. 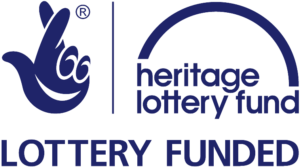 Over the next year, funded by our grant from the AHRC, Lois and Phil will host three arts workshops with war widows in London (9 November 2018), Edinburgh (6 April 2019), and at the National Memorial Arboretum (8 June 2019) as well as conducting home visits (funded by Arts Council England) to ensure as wide a range of women as possible can contribute to the quilt and the poetry. Phil and Lois are experienced in working with groups whose experiences have been ignored, forgotten, or untold. War widows are often overlooked in the monolithic representations of remembrance (the Cenotaph or local war memorials), and their experiences are frequently overshadowed by a rhetoric of patriotism and duty that focuses on the sacrifices of servicemen. We hope that by finding new ways of telling war widows’ stories, it will open up new approaches to aid the articulation of often very intimate and personal experiences. In consequence, we hope that the public will connect and create their own understandings of the new material created. Indeed, our warm reception and informative conversations with members of the WWA certainly made a positive impression on Lois and Phil who have blogged about their experiences of the evening on their website. You can read their thoughts and reflections here: https://arthur-martha.com/blog/. Armed forces fabrics for the war widows’ quilt. On the afternoon of 9 November 2018, the first of our three arts workshops will take place amidst the stunning collections of The Queen’s House, Greenwich, which is part of the National Maritime Museum and will also see the War Widows’ Stories Remembrance Reception that same evening. If you are interested in attending either of these events, please do get in touch with us via email (info@warwidowsstories.org.uk).